This product is no longer available and has been replaced by: 03002-L. 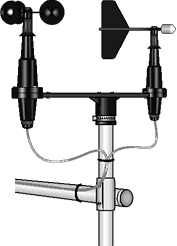 The 03001-LC consists of a 3-cup anemometer and a wind vane mounted on a small crossarm. The "-LC" version of this product terminates in a connector (instead of pigtails) for use with a CS110 Electric Field Meter or MetData1 Weather Station. The length of the cable is specified at the time of order. This version of the 03001 Wind Sentry Set has a connector rather than the standard pigtails. The connector attaches to the CS110 Electric Field Meter or the retired MetData1 Weather Station. The 03001-LC consists of a 3-cup anemometer and a wind vane mounted on a small crossarm. The cup anemometer measures wind speed. Rotation of its cup wheel produces an ac sine wave that is directly proportional to wind speed. The frequency of the ac signal is measured by a data logger pulse count channel, then converted to engineering units (mph, m/s, knots). The Campbell Scientific version uses shielded bearings which lowers the anemometer’s threshold. Wind direction is sensed by a potentiometer. With the precision excitation voltage from the data logger applied to the potentiometer element, the output signal is an analog voltage that is directly proportional to azimuth of the wind direction. Rated 1 W at 40°C. Rated 0 W at 125°C. The 03001-LC is used with the CS110 Electric Field meter and the retired MetData1 Weather Station.